Looking for Bodine Electric Company’s website? Click here. Known for their reliability, long life and competitive prices, Bodine gearmotors are found in many demanding industrial and commercial applications. Bodine has helped thousands of customers solve application challenges, develop gearmotor and drive solutions, and deliver high-quality products. Bodine offers a full range of fractional horsepower motors. AC fixed and variable speed motors are offered with three winding types: permanent split capacitor, split phase, and three-phase. PMDC motors are available with voltage ratings from 12 to 180 VDC. 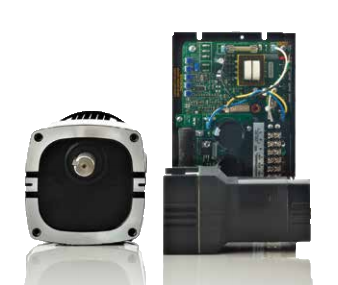 Brushless DC motors are available with voltage ratings of 24 or 130 VDC. 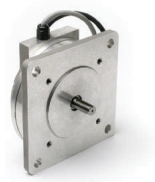 Bodine’s unique INTEGRAmotor combines a motion control, a brushless DC motor and a gearhead in one compact ackage. They provide simplified wiring, reduced panel space, faster assembly times and lower system costs. The perfect match of motor, speed control, and gearhead provides simplified wiring, reduced panel space, faster assembly times, and lower system costs. Bodine motion controls are precisely engineered to provide maximum performance from our motors and gearmotors. Bodine designs and manufactures a complete line of permanent magnet DC controls for 90/130V PMDC motors, and brushless DC controls for 24V and 130VDC motors. We also offer 3-phase AC inverter controls. The e-TORQ motors employ a unique electromagnetic design to improve efficiency, minimize size, and maximize torque. They are ideal for OEM applications where high torque, very compact design, enclosed construction, and economy are necessary.